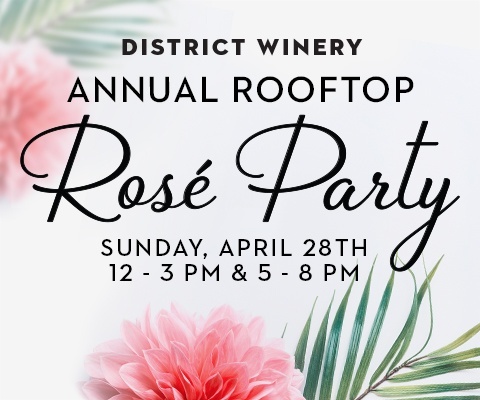 Join us for our second annual Rooftop Rosé Party on Sunday, April 28th. The rosé party will be held in the second floor private events space, which is rarely open to the public and boasts a wraparound terrace and sweeping views of the Anacostia River. Our Pet-Nat is a spritzy sparkler made from Barbera grapes. Think light, refreshing, and fizzy – a perfect springtime wine! Our Ramato-style Pinot Gris is an Italian-inspired skin contact white wine. This orange wine is s stunning amber color and offers a rich mouthfeel and notes of scotch, coffee, and honeyed fruit. The 12pm session has SOLD OUT. Check back on April 25th at 12pm for any last minute ticket availability. ADD A BOTTLE OF ROSÉ TO TAKE HOME FOR JUST $15. Tickets are for one session only and include food and three alcoholic drink tickets. Additional drink tickets will be available for purchase. All attendees MUST BE 21 years of age or older. Unfortunately, we cannot allow children or pets at the event. All ticket sales are final and non-refundable. Tickets may not be transferred. Event is indoors/covered and will be held rain or shine.